Assessing the toxicity of oil is a tricky business. The main difficulty is that "oil" is a mixture of many different chemicals, and no two oils are the same. Proportions of chemicals vary even within a single category of oil, like crude oil or diesel oil. For example, Arabian crude oil, Louisiana crude oil, and Alaska North Slope crude oil represent very different mixtures that will behave differently in the environment and have different toxic effects to exposed organisms. Oil, in high enough concentrations, can poison animals by internal and external routes of exposure. 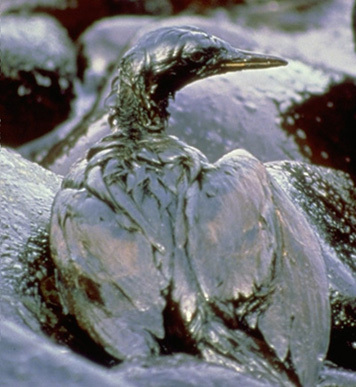 Birds and mammals often die because oil fouls fur and feathers so that they no longer insulate. Smaller organisms can be smothered by a thick layer of oil washing ashore. Recent research studies by NOAA scientists have shown that even small amounts of petroleum hydrocarbons can impair the successful development of fish eggs and embryos. The oil from the Exxon Valdez killed or injured in all of these ways. We also now know that our attempts to clean up an oil spill can indirectly harm some of the resources we are trying to protect. For example, using hot water or chemicals to remove oil can harm plants and animals, and simply sending a team of cleanup workers into an oiled area can trample sensitive organisms and mix oil more deeply into a beach. The experts who respond to oil spills must consider all of these potential problems when evaluating the trade-offs of how far to go in removing spilled oil. The Exxon Valdez was, to that point, the most studied oil spill in history. However, the 2010 Deepwater Horizon/BP oil spill will become the new standard for impact and assessment studies and will substantially increase our knowledge about oil spill impacts. The Toxicity of Oil: What's the Big Deal? Explore why oil is toxic and how different recipes for oil can have various toxic effects on living things. What Is Weathering? 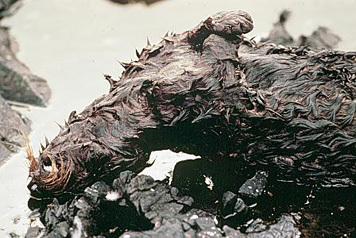 Learn about happens to oil when it interacts with the physical environment and what we can learn about this behavior from the 1989 Exxon Valdez oil spill. Oil Types: Find out more about different kinds of oils and how they can behave differently when spilled in the ocean.